I remember a time when I was so excited to start my family. The joys of being a parent are something that cannot really be explained in words – it’s something you can’t even fathom until you’re knee deep in it and take time to reflect on how incredible it can be. With that being said – who actually knew just what a full-time job it could be to keep up with kid’s toys! Have you ever stepped on a Lego? I am pretty sure that pain is the worse than a broken bone. So, before another season of chaos, wrapping paper, and new toys comes and goes – I am on a mission to organize the toys and books we have and donate the ones we don’t need to Goodwill. 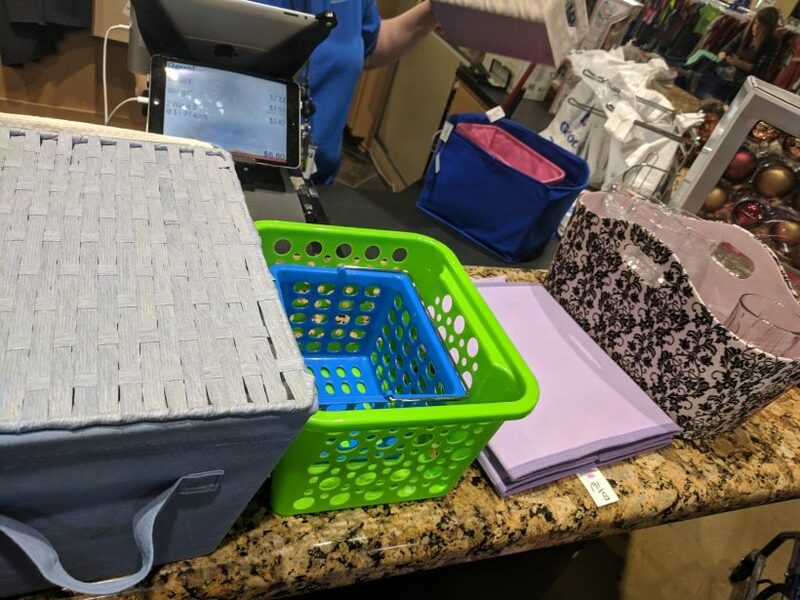 When I first started this mission, I stopped by several retailers around town only to find that storage tubs, shelves, and even fabric totes were off-the-charts expensive! It is, after all, the holiday season and my budget is already tight. 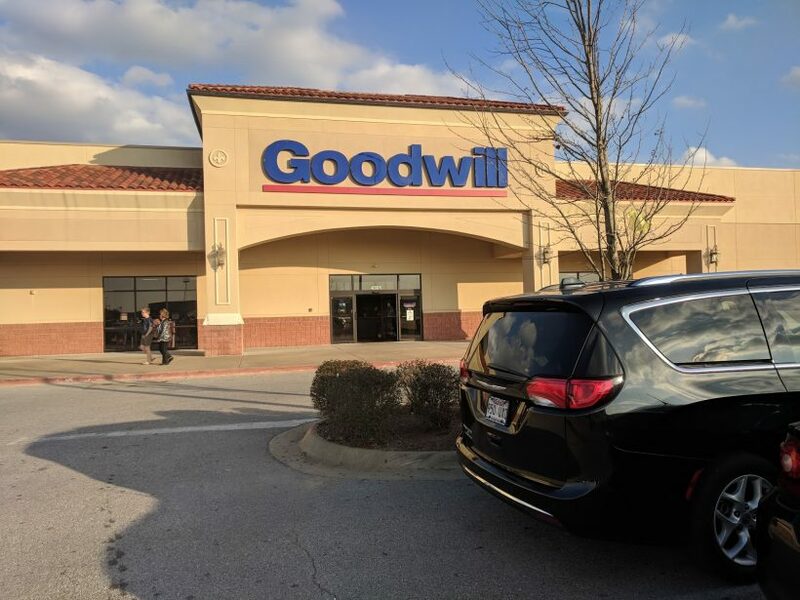 I walked out of those stores as fast as I walked in and headed to my local Goodwill store – and if you’re lucky, you have more than one close to you! 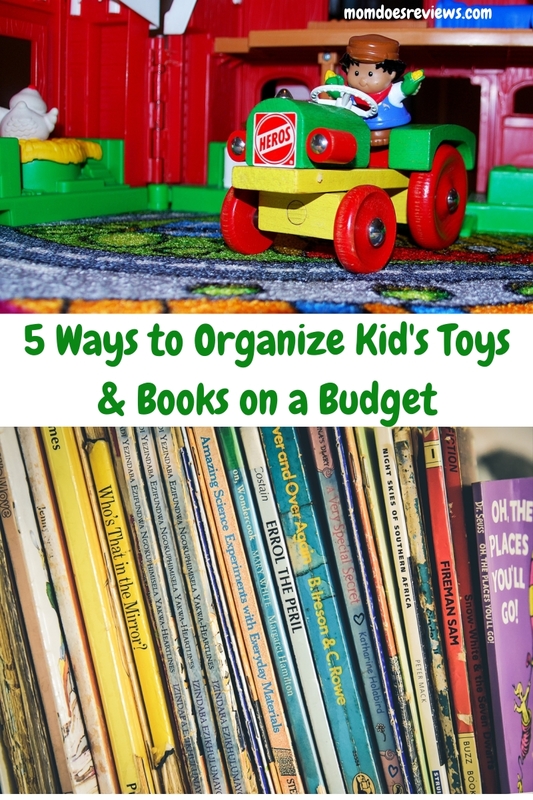 In order to do this toy and book organizing on a budget, I knew I was going to have to think outside the box to find untraditional methods and items that could be used for my mission. And of course, I found everything I needed at Goodwill! Be sure to shop the whole store because you might see something that sparks an unconventional idea or way to organize while you’re browsing! Wall storage – this can be anything from a shelf, to a fabric shoe hanger, to a gutter that would traditionally go on the outside of your house. Look around and see if you can find something that would hang and hold the books. Bookshelves – this might seem obvious, but just throwing your books on the shelf is messy. Use bins, tubs, and other things to not only store but organize your books. Toys – oh the joys of toys! Zipable or otherwise closeable bags are the perfect place to collect and store those (ouch) Legos, matchbox cars, or other small items that need a place. Hangable fabric shoe organizers can be a great way to not only store things but see what you’ve stored to easily grab it out to play with. Think barbies, arts and crafts, and this might even work for the matchbox cars or Legos. Plastic tubs or drawers are always a great tool for organization. You can even get creative if you have little ones by printing off a sticker or tag of some kind to help them remember where each type of toy goes when it’s time to clean up. Magnetic strips on the walls can be a perfectly simple way to store anything that is metal – such as matchbox cars. Laundry baskets, especially tall ones or ones with lids, can be a great way to store those stuffed animals. It may not seem like organization, but when all of those fluffy things are in one place, it will feel great. Hooks and baskets – If you don’t mind putting a small hole in the wall, hanging some hooks that baskets can then hang on is a brilliant way to easily store and organize toys. You can also get the stickable hooks that won’t damage your walls. What other creative ideas have you come up with for organizing your kids toys on a budget? We’d love to see your unique ideas and Goodwill finds! Share them with us on social media using the hashtag #ShopGoodwill. P.S. By shopping at your local Goodwill for your organizing mission you’re not only getting a good bargain, you’re also supporting a great cause. Did you know that 87 cents on the dollar of every purchase from a Goodwill goes towards local job training opportunities? You can find your nearest Goodwill store at http://www.goodwill.org/locator/. You never know what treasures you will find there, but you can be confident you’ll be helping your local community!